Action from the first round, as Kelso, in black and white, take on Marr. 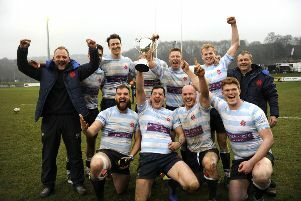 The Richmond side displayed their prowess as soon as they stepped on to the Melrose turf in round two and lifted the Ladies Trophy for the first time since the mid-1960s after defeating Edinburgh Accies 29-12 in the final. They also ended the Borders clubs’ interest in this year’s tournament, beating Jed-Forest comprehensively in the semis. Jed had advanced the furthest of the local clubs, squeezing past Boroughmuir in round two before seeing off holders Watsonians in the last eight. The British Army, US Tigers and Stellenbosch University from South Africa were other visitors who helped light up the competition, while Edinburgh Accies maintained the threat they carry in 2019 by reaching their second final in two weeks. Final - London Scottish 29, Edinburgh Accies 12. Semi-finals – London Scottish 43, Jed-Forest 7, British Army 12, Edinburgh Accies 19. Quarter-finals – London Scottish 31, Stellenbosch University 19; Jed-Forest 21, Watsonians 10; US Tigers 19, British Army 24; Edinburgh Accies 14, Melrose 10. Second round – Heriot’s 7, London Scottish 36; GHA 0, Stellenbosch University 36; Boroughmuir 12, Jed-Forest 15; Currie Chieftains 12, Watsonians 19; Marr 12, US Tigers 14; St Andrews University 7, British Army 22; Edinburgh Accies 29, Durham University 10; Edinburgh University 12, Melrose 22. First round - Peebles 19, Heriot’s 22; GHA 28, Selkirk 14; Boroughmuir 31, Hawick 5, Currie Chieftains 17, Glasgow Hawks 5; Kelso 7, Marr 24; St Andrews University 20, Gala 19; Ayr 0, Edinburgh Accies 40; Edinburgh University 26, Stirling County 21.